As both entrepreneur and intrapreneur share similar qualities like conviction, creativity, zeal and insight, the two are used interchangeably. Entrepreneur refers to a person who set up his own business with a new idea or concept. Intrapreneur refers to an employee of the organization who is in charge of undertaking innovations in product, service, process etc. Entrepreneur: He is independent in his operations. He is fully independent. He does not work for others and his own boss. 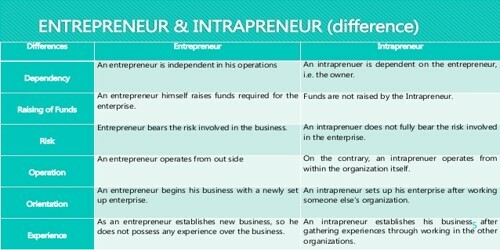 Intrapreneur: But, an intrapreneur is dependent on the entrepreneur, i.e., the owner. He depends on corporate owner. He works for corporation under defined rules and regulations. Entrepreneur: He manages required capital himself. He raises fund for new business. 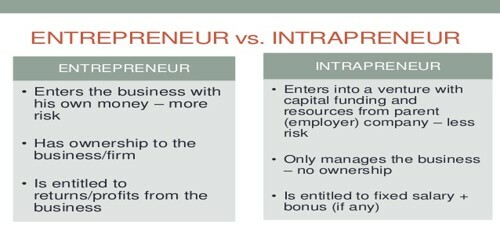 Intrapreneur: He does not need to manage required fund because corporation raises capital for the business. Entrepreneur: he bears the risk involved in the business. He bears 100% business risk. He risks own money. Intrapreneur: He does not fully bear the risk involved in the enterprise. He does not bear full risk of the business, He risks others money. Entrepreneur: Primary motive of entrepreneur is to be independent, self-satisfaction and earn monetary reward. Intrapreneur: He has the motive of advancement and promotion with fixed salary. Entrepreneur: He does not follow strict timetable. It may take several years for the growth of the business. Intrapreneur: He is bounded by the corporate timetable. Entrepreneur: He is guided by the principle of ‘ Problems provide opportunities’. Intrapreneur: He thinks that the problems are threats for him and his corporation. Entrepreneurs provide the spark. Intrapreneurs keep the flame going. Entrepreneurs are found anywhere their vision takes them. Intrapreneurs work within the confines of an organization. Entrepreneurs know the business on a macro scale. Intrapreneurs are highly skilled and specialized.What makes entrepreneurs and intrapreneur similar is the passion to see things through to the end and the courage to face failure.